Bright and Breezy Crafts: Good luck at high school! I cannot believe my lovely niece is starting high school later this week! I hand-drew / wrote everything on this card, except the ladybug family! the ruler, calculator, pencils and eraser. Some of the items, I raised on 3d foam before putting on the card. and I put glossy accents on their shells. Very creative ... she's going to love it! Thanks so much for joining us at The Sisterhood’s ‘SCHOOL TIME’ challenge and please come back again soon! I just love this card! My Lady bugs look great on a black and white background! Wow! 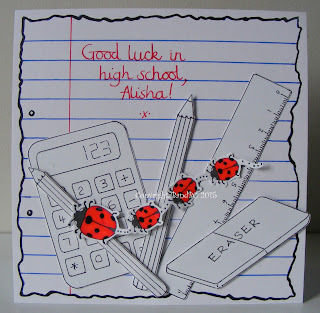 Fabulous back to school card; love all the hand-drawn elements! Thank you for sharing with us at The Sisterhood of Crafters. What a wonderful card for your niece...thank you for sharing with us at Fussy and Fancy! Good luck! With this card, the little lady will have a great start back to school ;)) Gorgeous !! Great card! I love ladybugs and they are all in a row on your card! Thanks for joining us at The sisterhood of Crafters! Wonderful design. 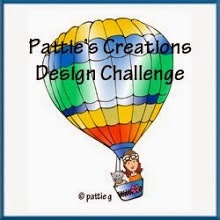 Thanks for joining us at The Crafter's Cafe this fortnight for our "Monochromatic" challenge. 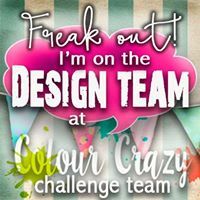 Our next challenge goes live 15th September, hope to see you then. How cute!!! Thanks so much for participating in our MELONHEADZ challenge!!! Can’t wait to see you participate again in our next challenge!! 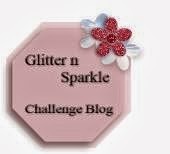 Thank you for taking part in crafter's cafe blog challenge no 132! Lovely card! Great idea to use the Ladybug and Family image. The color pops beautifully on your black and white background! Love this card!